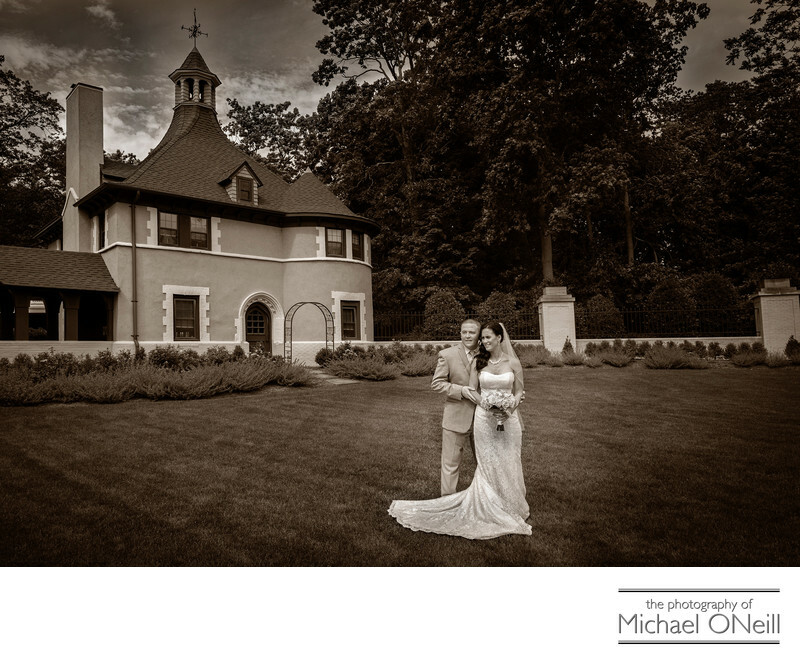 Great Long Island LI NYC Wedding Photo Locations. Lombardi’s on the Sound at the Port Jeff Country Club at Harbor Hills, located in the exclusive Belle Terre Village section of Pt Jeff, Long Island, NY is one of the most beautiful waterfront wedding celebration venues on LI. Overlooking the Long Island Sound your guests will be treated to spectacular water views during your party. Often times, however, my brides and grooms want to take all of their wedding pictures before the wedding reception and ask me for suggestions on great locations at which to capture amazing wedding photographs. This spot is one of my favorites. It is the location of the Belle Terre Village offices and is literally three minutes away from Lombardi’s on the Sound. The sprawling grass lawn and the old fashioned tudor style building makes for an elegant background for the formal photographs of the couple, their wedding party and their friends and family. No matter where on Long Island or New York City you are hosting your wedding celebration, I will know of a convenient location for beautiful wedding pictures nearby your reception venue. Sometimes couples ask for parklike grounds such as those pictured here. Others wish to be on the water…on the beach. Still others want a more contemporary, edgy look in an urban environment. Regardless of your personal preference I will be happy to suggest the perfect spot on LI or in NYC at which to capture your wedding memories.